The $265 million Woomargama Bypass will improve road safety and save fuel and travel time for vehicles travelling between Sydney and Melbourne. ARC’s skilled team of engineers, designers and schedulers worked closely with the project team to produce 520 tons of steel reinforcing and 36 tons of mesh. The Woomargama Bypass is one of the last remaining town bypasses in the 32 kilometres Hume Highway duplication project. Woomargama is approximately 50 kilometres north of Albury. The nine-kilometre Woomargama Bypass is under construction to the west of Woomargama and includes twin bridges over Mountain Creek and Sandy Creek and two ‘at-grade’ intersections. The total construction involves 1.6 million cubic metres of earthworks and 200,000m2 of concrete pavement. The bypass will improve road safety by diverting most heavy vehicle movements from Woomargama, which currently carries approximately 2,000 heavy vehicles per day. It will also save travel time for motorists with its 110km/h speed limit and is scheduled to be completed by the end of 2011. Merging acceleration and deceleration lanes, for access into and out of Woomargama. Deep cuttings of 15 metres or greater through sections of the western slopes of Mount McKenzie. Landscape and urban design treatments to minimise visual impact. Environmental controls to minimise impacts on nearby waterways and natural areas. 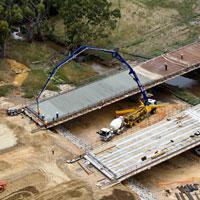 The Hume Highway Woomargama Alliance was formed to design and construct the Woomargama bypass. The alliance team comprises the NSW Roads and Traffic Authority, Abigroup and Sinclair Knight Merz. ARC is a supplier to Abigroup. ARC manufactured and supplied 520 tons of reinforcing steel for the piers, abutments, approach slabs, drainage pits and paving at its site in Victoria. A significant amount of accessories were also supplied to the project on an ‘as-needs’ basis. With more than 90 years experience in steel reinforcing, ARC met the project challenges of suppling steel reinforcing products including abutments, piers, diaphragms, decks, approach slabs, culverts, drainage pits, batching plant and paving. ARC’s experienced schedulers made the project more efficient with planning, load compiling, organising design issues and managing 14 different contacts. Grzes says ARC’s flexible and proactive attitude ensured the smooth delivery of reinforcing steel to the site. ARC also developed a range of solutions for the project that reduced risk, man-hours and cost both on and off site. Experienced ARC schedulers ensured the project remained cost efficient despite its remote location—50 kilometres north of Albury. Grzes says using ARC’s specialist experience, some of the steel reinforcing was prefabricated in the factory and then delivered to the site. ARC also supplied steel reinforcing for the project’s two twin bridges: Sandy Creek Bridge (32 metres long) and Mountain Creek Bridge (129 metres long). Image supplied by the Hume Highway Woomargama Alliance. Kirsten Leiminger is a consultant for Mendleson Communication, which is the publicist for ARC. Kirsten Leiminger has written 5 articles for us.